Purr-fect Christmas Gift! The SPCA is selling Autobell $20 Gift Cards to raise funds for the animals. Purchase your Autobell Gift Cards from the SPCA for $20 and the animals get to keep 50% of the sale. Great for teacher’s gifts, stocking stuffers, or treat yourself to a clean car! These tickets are good anywhere and they never expire! Where can you purchase the SPCA Autobell Gift Cards? Buy Your Attractions Dining & Value Guide from the SPCA & Support the Animals! Purchase the brand new Attractions Dining and Value Guide from the SPCA for $25. $10 coupon to Bestway and the $10 coupon to Deep Roots Market (Harris Teeter will also honor these coupons as competitor’s coupons). $5 coupon to Ace Hardware (Lowes and Home Depot will also honor this coupon as a competitor’s coupon). Your Attraction Guide is now paid for! You have helped the animals and you still have a book full of BOGO offers at local restaurants and merchants and 15 months to enjoy your savings! Can you help even more by selling Attractions Guides to your friends, family and co-workers for the SPCA? Attractions Guides make a great gift too! The SPCA has Alamance Attractions Guides available too! You can also purchase Attractions Guides from all 21 other locations in NC, SC & Virginia, just email kannettedorsett@triad.rr.com . Where can you purchase your Attractions Guides from the SPCA? Thank you for helping the needy animals in our community! Pets by Josh donates 4% of pet portrait sales to Animal Charities. Visit www.petsbyjosh.com to learn more about Josh and to place your order. And remember to choose SPCA of the Triad during the ordering process. Thank You! Bissell is a new partner. If you are shopping for Bissell Products please select SPCA of the Triad and a portion of your purchase will be donated to us. Free shipping on orders over 40 dollars. Help SPCA of the Triad when you shop. 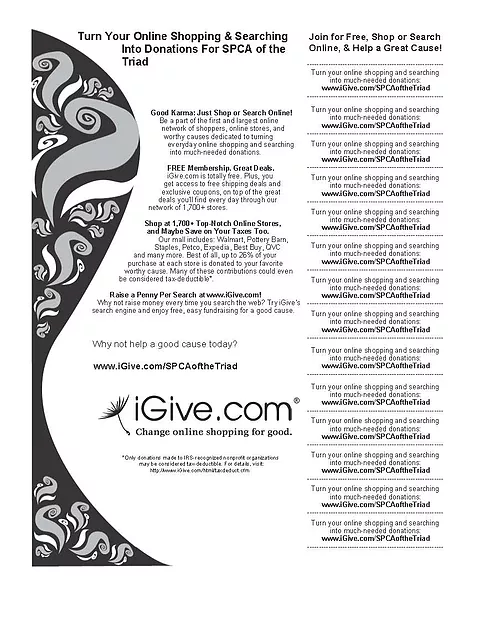 Simply download the iGive.com button! This tiny addition to your browser automatically tells stores that you want your shopping to support your favorite cause or charity. Attention Amazon shoppers! Did you know that each time you make a purchase you can help the SPCA at no cost to you? Simply place your order and select SPCA of the Triad, and the donation is automatically made. Financial information about this organization and a copy of its license are available from the State Solicitation Licensing Branch at 919-807-2214. The license is not an endorsement by the State.